Our next Pay that Paid Off was not directly nominated by a reader, but rather came out of a reader's nomination. Before any of the games had even kicked off on Sunday, one of the members of our Facebook group, Joel Day, an Eagles fan, nominated a future play to be broken down - specifically, he requested (direct quote) "Can you break down one of Vick's many interceptions that he will throw tonight against the Ravens? As much as I love my Eagles, and I'd love to see them win, I'm not holding out hope". Well, luckily for Joel, his hopelessness was unfounded as Vick's 1-yard touchdown run inside the 2-minute warning saw them scrape a victory over the Ravens to remain undefeated. Nonetheless, Vick did throw two interceptions in the game - how did you possibly know that was going to happen Joel? You must have a crystal ball stashed somewhere! - but, when deciding which plays to break down this week, I was actually drawn to an interception by his opposite, Joe Flacco. Vick's first interception was a case of a misplaced throw under duress; his second was the result of a freak bounce off the hands of his intended receiver, and not actually his fault. Flacco's interception, on the other hand, was all on him, and gives us a great opportunity to show how disguising coverages on the part of the defense can trick quarterbacks into throwing interceptions - before the ball is even snapped. 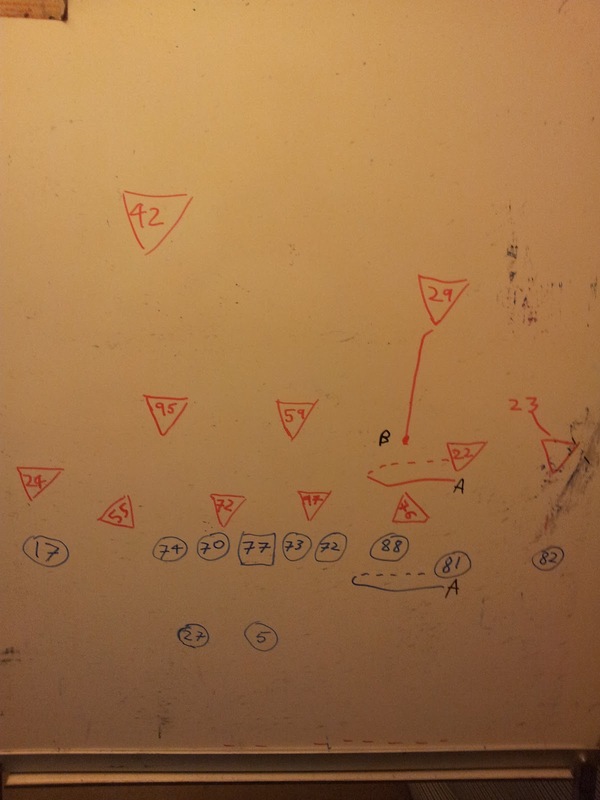 NB: Diagrams are approximate guides and not to scale, nor will they be until I get a wider whiteboard. After the huddle: The Ravens line up in a 3-wide set, with the third receiver in the right slot, the tight end split out from the line and in a 2-point stance, Flacco in shotgun and Rice split slightly out to his left. The two offensive tackles is slightly split out from the interior OL (not shown on the board due to lack of board width) in order to be in better position to deal with the DEs. The Eagles line up with their DEs in a 'wide-9' (technically one wide-9 and one wide-5) alignment, tilted to the line to get a better angle to get past their blockers. The Philadelphia safeties line up in a cover-2 shell, with Asomugha lined up in press on Doss, and the other two corners about 2-3 yards off the LOS across from their respective receivers. Pre-snap: Boldin motions infield to the gap between Pitta and Osemele, then back to his original spot; Boykin follows him ('A' in Fig 1). When Boldin and Boykin return to their original positions, the strong safety, Allen, comes into the box and lines up across from, but a good 8ish yards off, Pitta ('B' in Fig 1). Unbeknownst to Flacco, these two pre-snap occurrences have already set him up to throw an interception. On every play, of course, a quarterback must look at the defense for clues as to the type of coverage they are running, as different coverages will have different keys that the quaterback will look for while progressing through their reads (i.e. going looking to the receivers in a pre-determined order to see if they are open or not). 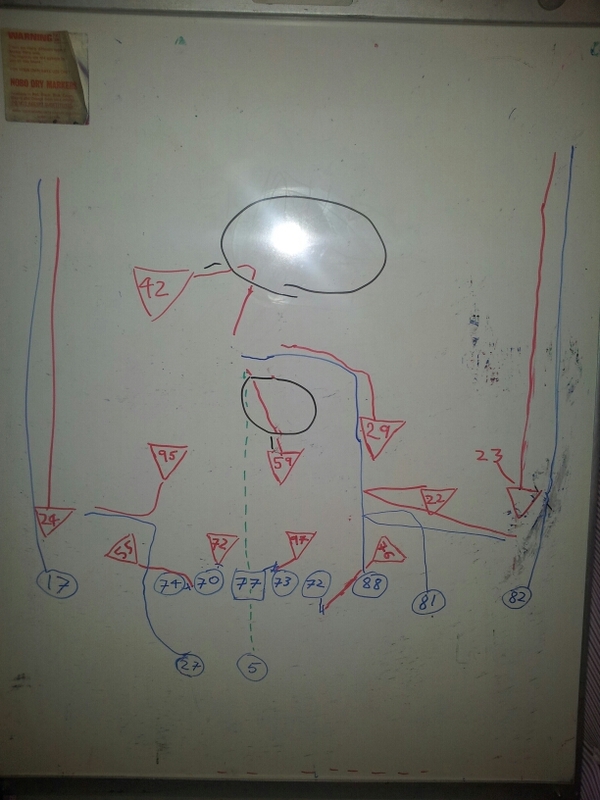 Initially the defense lines up with two high safeties, implying either a Cover-2 or a Cover-4 shell. One way a quarterback tries to read the coverage is by having a player motion in one direction, and then back to their original position, purely to see how the defense adjusts. On this play, by Boykin following Boldin in motion, it will appear to Flacco that the defense are in man-to-man coverage (though at the NFL level, things are rarely as straight forward, as we will soon see). This therefore presents as Cover-2 with man coverage underneath. With only two linebackers on the field, this would suggest that one is matched up with the running back, and the other with the tight end (as often occurs in man coverage, such as on this play). Allen, the safety, then drops down into the box. Looking at it from a quarterback's perspective, this could suggest that either Allen is merely coming into the box to stop the coverage looking like a Cover-2 man-underneath , with the expectation that he will drop back at the snap (such as the Browns safety in the play I just linked to), or actually indicates either a Cover-1 or Cover-3 shell. Flacco must have seen the safety coming down; whether he assumes this is merely to try and disguise a Cover-2 or that the Eagles are actually in a different coverage shell, I'm not sure, but based on how the play develops, it is clear he must not have recognised what the defense was doing. The play: If you've been following out Five Plays that Paid Off series, then you may be surprised at Fig 2, as, for the first time, there's not a single letter on there to point out the key parts of the play. I know, it feels weird for me, too, but there's simply no need for them here - all the required actions by the defense occurred before ball ever left the center's hand. As explained above, it appeared from the pre-snap alignment of the defense that they were in fact playing either Cover-1 or Cover-3, and a cursory glance at the position of the corners would have told Flacco that it would likely be Cover-1, and, thanks to Boldin's motion, it appeared that the defense were playing in man, not zone, coverage underneath. Simple mathematics, however, tells us one thing: with defenders matched up one-on-one against three receivers, a tight end and a running back requires five defenders; there are four defensive linemen going up against five offensive linemen, plus the single high safety all together accounts for ten defenders. That leaves one defender left over. The coverage the Eagles are actually playing is usually termed "Cover-1 Robber" - you've probably seen the name in a defensive playbook on Madden. This play demonstrates exactly where the name comes from. It is a Cover-1 shell - Kurt Coleman being the lone deep safety - with man coverage on the five receiving threats, which leaves a free defender, who in this case is DeMeco Ryans. This defender actually adds a second 'zone' defender on the play in addition to the deep safety, which, as shown on the board, is underneath the deep zone and in the middle of the field. The outside corners use the traditional technique for man coverage in Cover-1 - letting the receiver get outside of him, but pressing him along the sideline, effectively using it as an additional defender, in order to severely narrow the passing window for the quarterback. Boldin and Rice both run 'out' routes, but are well covered by Boykin and Kendricks respectively, giving no real opportunity for Flacco to get the ball to them. That leaves the tight-end Pitta, being covered by Allen. If the defense were playing in a Cover-2 shell, Flacco absolutely would have picked the correct receiver, as Pitta gets some separation from Allen and Flacco aims the ball in front of his tight end, where only his intended target could catch it. Unfortunately for Flacco, the coverage is Cover-1 Robber. Ryans plays his underneath zone well, staying in the middle of the field and reading the quarterback's eyes. Ryans sees Flacco looking at Pitta and winding back his arm to throw. It is important to note that, while the protection is far from perfect, the Ravens do prevent any real pressure on Flacco, and though Jenkins does come free and give him a thud after he's released the ball, it is from side-on, not in Flacco's face, and the quarterback almost certainly didn't see him coming. The play therefore wasn't a result of a rushed throw by Flacco, but purely a result of Flacco misreading the coverage. So, from Flacco's perspective, he's seeing Cover-1 with man coverage on his receivers. Both deep threats are covered; both out routes are covered; but there, in the middle of the field is his tight end, getting separation from the only defender covering him. Flacco knows he can get the ball to Pitta before Coleman will get to the ball, so it appears a 'safe' read... except he never accounted for the eleventh defender. For Ryans, it is simply a matter of reading the quarterback, and seeing the throw, backpedaling to where he can see the ball is going. The ball flies out of Flacco's hand, along the green dotted line in Fig 2, and into the hands of DeMeco Ryans, who jumps to his right, in front of Pitta, and, as the coverage suggests, robs the ball from Baltimore. The ensuing Eagles drive results in a touchdown, bringing the score from 17-7 to 17-14, a crucial moment in the come-from-behind victory for Philadelphia. Remember, as you're watching the football today, tonight and tomorrow night, if you see a play that particularly impresses you, and you want to see it broken down here (or even if you just want to get your name in the blog and make all your friends jealous) you can nominate any play to be featured in next week's breakdowns by tweeting out a description of the play with the hashtag #TPL5plays or nominating it in our Facebook group - and we love nominations, so nominate as many plays as you like! So keep your eyes peeled for great plays, be sure root for whichever team I've predicted in the Inter-Blog Prediction Game, and have a great day of watching football!